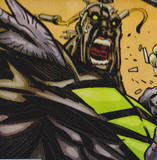 Other Distinguishing Features: Grayish black skin, with a green symbol embedded on his chest. NOTE: Amok is owned by Gary S. Carlson and Scot Eaton. Amok is part of the Radanian race that was enslaved and genetically altered by Kalyptan people. Fearing for their safety the Kalyptans destroyed the Radanian planet, while Amok survived as the last of his race. He spent nearly 80 years fighting the Kalyptans until during a battle with Vanguard, Roxanne convinced everyone that he wasn’t a mindless beast. Wally linked up to Amok’s brain to communicate. However, Supreme sucker-punches the pair destroys a good portion of Amok’s brain. Years later when the Tyrrus Combine attack Vanguard’s ship Modem takes control of Amok and has him brutally beat the Tyrraneans that have attacked. When Vangaurd thanks Amok, he says he only did what he did for Roxanne, as he has no love for Vanguard and his people. He later jumps into space to destroy countless of the Tyrranean ships with his bare hands. Lurch also takes his form to help out. While examining one of the Tyrranean ship while on Earth, it is discovered that the the ship’s tentacles are full of Tyrranean eggs. Amok decides to eat them. Amok, along with Vanguard and crew then leave Earth and decide to head back to Vanguard’s home planet. Once they reach the planet, Amok remains loyal to Vanguard and leaves with Vanguard.